Painted by Paolo Uccello (1443). 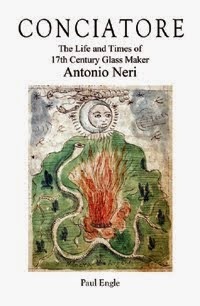 In his 1612 book on glassmaking, many of Antonio Neri's recipes depend on timing. In two recipes, he uses recitation as his method. "Mix this tartar with the sifted kermes, and when the water in the kettle boils, put in all the kermes, and let it dye the water, reciting the Miserere Psalm once." (ch. 117.) The 50th (51st) psalm begins "Miserere mei, Deus..." (Have mercy upon me, oh God...). Assuming he was using the Vulgate version adopted by Clement VIII in 1592, recital takes about 2 minutes 15 seconds without rushing. "Mix the powders, and always give them to the glass in six portions, stirring the glass well. Set the interval from one portion to the next by reciting the [Apostles'] Creed." (ch. 65.) There are shorter versions, but assuming he used the creed of Pius IV, adopted at the council of Trent in 1564; recitation takes a little under 3 minutes. There are dozens of other instances where Neri calls for periods in time ranging from hours to days to months. In several cases he specifies the duration of a half-hour, implying the use of a clock or timer of some kind. So, it is worth taking a closer look at exactly how timekeeping worked in his era. In the early seventeenth century, water clocks and hourglasses were long common, and small spring driven mechanical clocks were becoming fashionable, although very few have survived until today. Judging by the unusual precision of birth times in the baptism entries for Antonio and his siblings, it seems likely that the family owned an accurate clock. For example, his own birth is recorded as 29 February, at 3 hours 25 minutes past sunset. This level of accuracy in the matter of birth was sometimes employed in anticipation of better astrological charts. It was common for a European town to have a public clock in their city hall or principal church; Neri’s home town of Florence, Italy, had both. In 1353, Nicolò di Bernardo built the city's first public clock for the Palazzo Vecchio. (It was replaced by a German clock in 1667, which is still there today). In 1443, Angelo Niccolai degli Orologi, (a grandson of the above Nicolò) built a second municipal clock, this one for Santa Maria del Fiore, installed inside the cathedral above the main doors. Compared to modern clocks, this one has some unusual features: The single hand runs counterclockwise, mimicking the motion of the shadow on a sundial. The twenty four hour mark makes its appearance at the bottom of the dial. (The actual clock mechanism was replaced in 1761 by Giuseppe Bargiacchi, but keeps time identically). These clocks were built after the invention of the escapement (the part that goes tick-tick, tick-tock), but before pendulums had been incorporated. Galileo realized the advantages of pendulums in timekeeping during our glassmaker Neri’s lifetime, although they were not acted upon for another half-century. The accuracy of any clock depended on the ability of its mechanism to keep a steady pace, and in the early seventeenth century, a fifteen minute error was not uncommon. 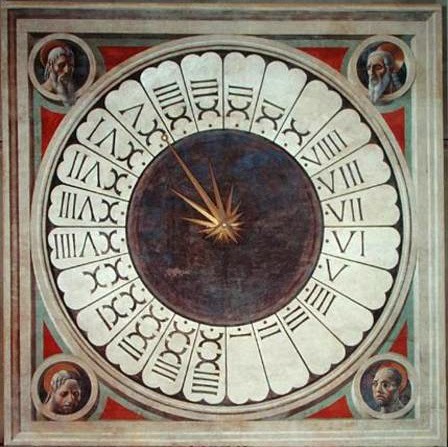 The clocks at the Palazzo Vecchio and Santa Maria del Fiore were checked regularly and adjusted based on the readings of a nearby sundial, so the time also shifted with the seasons. In Florence, and many other Italian cities, the custom was to start counting hours at sunset. Each day was divided into twenty-four equal hours. The start of the Church’s liturgical day was actually signaled a half hour after sunset with the ringing of the bells for the Ave Maria prayer during evening Vespers service. One o’clock was one hour past sunset, etc. This first hour was called "l’or di notte," [the night hour] and contrary to what one might think, it did not signal the beginning of a new calendar day. Each new day began with the ringing of the Campanile bells at sunrise. This Italian system of timekeeping (hora itálica) had been practiced for over a millennium, it was established by Julius Caesar for the Roman Empire. Not until 1750 did Italians adopted the current (French) system of two twelve hour shifts beginning at midnight.